Different breeds have different levels of grooming needs. Some breeds only need to be professionally groomed twice a year and others need grooming frequently. The Cocker Spaniel breed of dog is of the latter requirements. With its famously long and silky fur, distinguished drooping ears, and pre-inclined tendencies to roam parks and fields freely, the Cocker Spaniel certainly needs extra grooming attention. There are two types of Cocker Spaniel to take into consideration: the English Cocker Spaniel and the American Cocker Spaniel – and each individual dog may have different grooming needs. Your groomer will be able to advise you how much grooming your Cocker Spaniel requires. If possible, groom your Cocker Spaniel gently as a puppy so that they can get used to being groomed and are settled into it as an adult. Grooming Cocker Spaniels can be hard work and fairly time-consuming. Due to their long hair, Cocker often have burrs, seeds, and bits of twig entwined in their coats from playing outside, so make sure to groom them once you’ve walked them home. Now that you know why it’s important to groom your Cocker Spaniel, and how often to do so, let’s find out what tools you can use to sufficiently groom your Cocker Spaniel. Other brushes can be used, but gentleness and care when using them is key. A bristle brush is recommended for young Cocker puppies as the soft bristles are gentle on their skin as they are brushed. If you do decide to use a pin brush, you should use one with rubber tips – that way, you won’t inadvertently scratch your dog’s skin when brushing. Additionally, the rubber tips will also help to improve your dog’s blood circulation below the skin. Slicker brushes can be used for untangling knots and matting, for removing dead hair, and can reduce the frequency of shedding if used often. The slicker brush can also be used for smoothing the coat after grooming with a pin brush to give them a healthy, shiny glow. This brush may be used on any coat; however, they work better on longer-haired coats, and curly or silky coats, which is why they generally work so well when grooming Cocker Spaniels. Dog fleas and ticks not only cause your Cocker much irritation, they can also have a detrimental effect on his health, so it’s important to check his coat during grooming for signs of fleas. Flea Combs have very closely spaced teeth and are used to detect and remove fleas in the coat. This should be used in addition to regular pet flea treatment that’s been prescribed by a vet. A good pair of cutting scissors, roughly 7 to 8 inches long, may be used to keep your Cocker Spaniel’s hair under and around the ear canal neatly trimmed. You can also buy shorter scissors with rounded ends for trimming areas on and around the face so that his vision is clearer – the rounded edges won’t be an issue if he makes sudden movements. Finally, you can add a sublime finish to your Cocker Spaniel’s coat with thinning scissors. These are mostly used for thinning out long, overgrowing coats in summer to help your pet stay cool. Thinning scissors can be used to trim excess hair on the neck under your Cocker Spaniel’s ears; which needs to be kept neatly thinned out to prevent matting. Keeping the fur trimmed here also helps to get the air circulating around his ears and can help to prevent and combat bacteria and ear infections. When using any scissors on your dog’s coat, be extremely careful not to catch any folds of skin or the flap of the ear. Always ensure you have full visibility of the hair you are trimming and that your dog is sitting or standing calmly. If you detect any abnormalities within your dog’s skin and coat during grooming – new skin lumps, redness, sores or hair loss – speak to your vet for advice. Grooming your Cocker Spaniel can be a lengthy, time-consuming process, but it will help to keep his coat, skin, nails and ears in good health for a better quality of life. 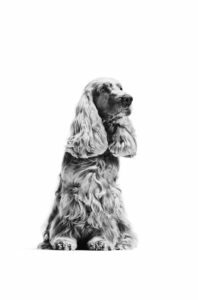 We hope this article helped to answer your questions about Cocker Spaniels and grooming. If you have any other questions about breeds, then we’d like to help. Submit your question below.